Railpictures.ca - Colm M Photo: Was down at the CP yard today, found this being shoved into the yard. It looks like it had some body work done. Any ideas as to why? | Railpictures.ca – Canadian Railway Photography – photographie ferroviaire Canadienne. Copyright Notice: This image ©Colm M all rights reserved. Caption: Was down at the CP yard today, found this being shoved into the yard. It looks like it had some body work done. Any ideas as to why? I received a couple of photos from an associate at the ONR car shop of GOT 366 upon its arrival in North Bay yard this morning. It had been tagged by some local ‘artists’ with the slogan “Trust Me! Go Green! N’ Clean!! Bombardier’s commissioned ONR to paint a number of their railcars prior to delivery. This has been going on for a couple of months now. Probably is. But that’s rare. I know they shipped streetcars unfinished to be completed here, but this? 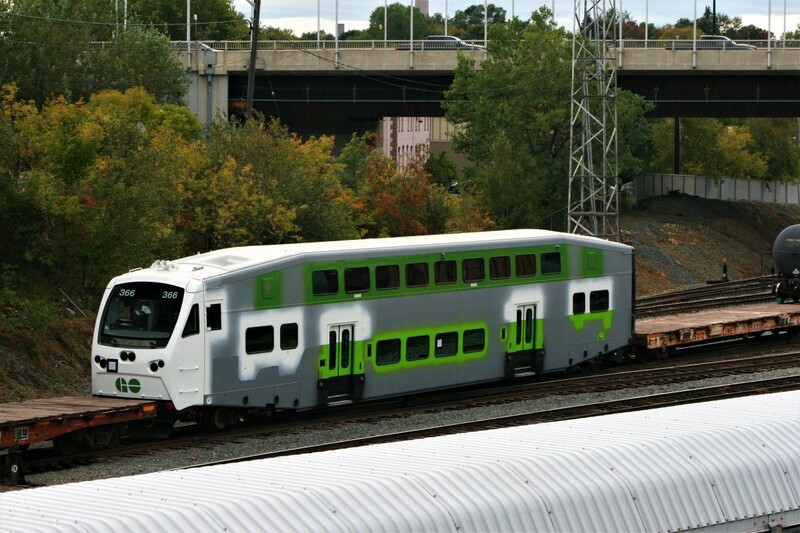 Then again, it would not surprise me if GO Transit pressed this into service immediately after signing off on it and completing the paint and lettering later. Railroads have done it. As for body work? No. This thing looks too “new” for that. Plus it would be in a lower number sequence if it was shipped back just for body work, but it would have to be major body work. Is this thing being shipped “unfinished”? ?